Child4-11 years old. Ages 3 and under are free. 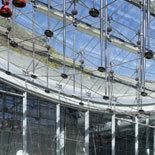 The California Academy of Sciences is the only institution on earth that houses a 4-story rainforest, an aquarium, a natural history museum and a planetarium under the same roof. This remarkable facility is home to almost 40,000 live animals and hundreds of interactive displays. 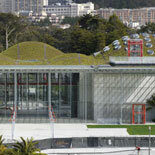 The California Academy of Sciences invites you to explore a vibrant rainforest, the era of the dinosaurs, the vastness of space and the depths of the ocean in its San Francisco facility. 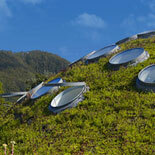 This leading cultural and scientific institution is housed in the world's largest eco-friendly public building. Blending seamlessly with the surrounding landscape, the living roof consists of 2.5 acres of indigenous California flora. 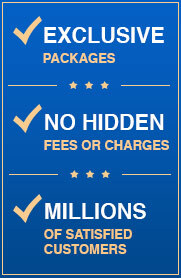 By pre-purchasing a general admission eTicket, you can bypass the lines at the intriguing shows and exhibits. 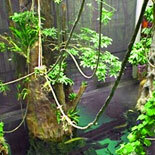 The 4-story glass-dome living rainforest will engage your senses with its colorful and raucous inhabitants. You will hear chirping birds, croaking frogs and clicking cave-dwelling bats. See whether you can find the chameleons and other masters of camouflage as they blend with the lush vegetation inside the spherical exhibit. Feel the earth tremble beneath your feet as you experience the disorienting effect of an earthquake simulator and learn about the geological characteristics of the San Andreas Fault. 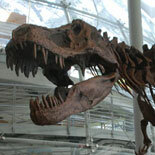 The Kimball Natural History Museum provides an interesting glimpse into the amazing world around us. Here, you can see the massive skeletons of a Tyrannosaurus Rex and a blue whale. View exhibits dedicated to the intriguing world of Madagascar and the Galapagos Islands as well as the majestic African ecosystem. The Morrison Planetarium hosts star shows using live feeds from NASA to create an accurate and interactive depiction of the cosmos. The facility is the world's largest digital planetarium. 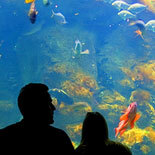 The Steinhart Aquarium is home to more than 38,000 aquatic animals from around the globe. You can view the sharks, stingrays and colorful fish that inhabit a tropical coral reef as well as an albino alligator and other creatures that live in a swamp. The aquarium has a tide pool, a coral reef and marsh habitats. There are daily shows and events, such as feeding time for the African penguins and the presentations by divers inside the coral reef enclosure. Purchase an eTicket today to avoid long lines at the ticket booth so that you have more time to explore the California Academy of Science. 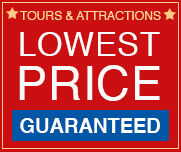 Your entire family will enjoy the entertaining and educational exhibits in this renowned attraction. Hours: Mon - Sat 9:30 am to 5:00 pm, Sun 11am to 5:00 pm. PLEASE NOTE: The building closes at 5:00 pm sharp. Visitors can enter the building until 4:00 pm. Open Thanksgiving Day 10:00am to 3:00pm with the last entrance at 2:00pm. Open Christmas Day 11:00am to 5:00pm with the last entrance at 4:00pm. You can exchange your voucher for your entrance ticket at the 'Service Desk' located at the right side of the main entrance. Street parking is located throughout Golden Gate Park and the neighboring areas. See Directions below for Parking Garages. Child Ticket: 4-11 years old. Ages 3 and under are free. Senior: 65+; Youth/Student: 12-17 years old. + Wheelchairs are available at the Coat Check on a first come, first served basis. + Accessible parking is available in the underground garage. + Listening devices are available for visitors who are deaf or hard-of-hearing. + Service animals for disabled persons are permitted.